Artist Suze Rotolo, the former girlfriend of Bob Dylan during his Greenwich Village days, has written a memoir, A Freewheelin Time, of her life with Dylan during the folk era of the early 1960’s. 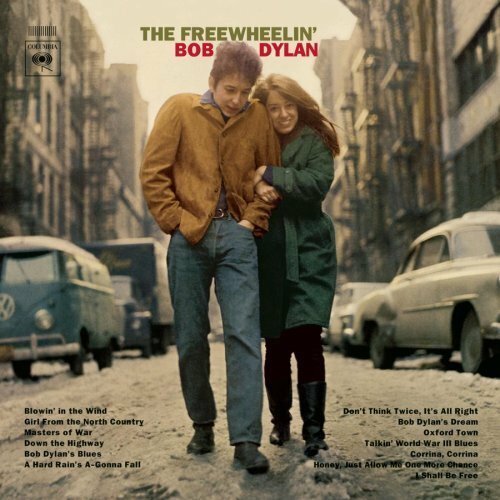 She received notoriety early on for her appearnce on Dylan’s breakthru album, The Freewheelin’ Bob Dylan (you may note our logo for the Cafe Homepage comes from a photo we took on the same street corner where cover of the album was shot). Her book is honest, transparent, well-written and shines light not only on Dylan’s early days and of the impact of his fame on their relationship, but also of life in Greenwich Village in its hayday. Many of Dylan’s early songs were inspired by his relationship with Suze Rotolo. Boots of Spanish Leather and Don’t Think Twice it’s All Right are among those inspired by her. Dylan writes generously of his relationship with Suze in his autobiography, Chronicles. You can listen to an interview with Suze Rotolo here at NPR. Hi BB,I 1st want to say that I love your Bob Dylan posts, as well as the Ang. I have been a big fan of his over the years.And, then, more specifically for the “heads up” on this Suze Rotolo book.When I saw the clips of Suze in the <>No Direction Home<> documentary, I was impressed by how beautiful she still was.Thanks again for posting!